Christmas is not complete until you have a poinsettia decorating a mantle. 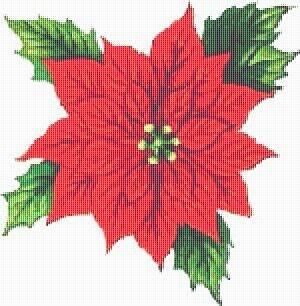 If you don't have a mantle, then you might want to create this colorful cross stitch pattern and add it to your wall during the Christmas season. It would look fantastic next to your Christmas tree! After Christmas, put it away until next year. This will make a great addition to your annual Christmas decorating. Count: 113 and 25 - both patterns included.